Welcome fellow traveller… fellow maenad, fellow satyr, fellow lover of the dithyramb, lover of the high dance-kick, lover of poetry and of the unmixed wine; of merriment, of madness, of frenzy and of ecstasy; of the festival, of the flute, of the thyrsus, of the ivy and of the carefree mind, of the freely soaring immortal spirit and of the front row! There was an altar devoted to Bacchus on the stage of the theatre of Dionysus, in Ancient Athens and a seat, in the front row of that theatre, reserved for his priests alone. I wish to take us all to the front rows of that theatre, the Fifth Century BC theatre and watch the goings on there, during the two annual festivals held in Bacchus’ honour, the Bacchic festivals, or as they’re better known, the Dionysian festivals. There, at the City Dionysia and the Lenaia, we can watch how four playwrights, three who wrote tragedies and one who wrote comedies dealt with the issues that troubled the lives of their fellow citizens and, at the same time, we can also listen to their good advice. And isn’t good advice also immortal? Watch and be entertained. It is a stage where the lofty gods and the lowly mortals once wrestled fiercely for justice, where the serious word and the noble deed vied with the vulgar for the better recognition and for the higher dramatic prize. Where, to pay cautious homage to Nietzsche, the dark guts battled with the enlightened head: Bacchus’ mighty forces of dark desire against Apollo’s brilliant light of wisdom, of truth and of conscience. Bacchus, Dionysus, Dionysius, Dionysos, God of fertility and desire, god of wine, Bromios (the noisy god), Eleutherios (the god who frees mortals from care) Enorches (the god with balls!) Lyaeus (the god who loosens the bands and shackles of everyday care), Oeneus (the god of wine), Liknites (the god who separates the wheat from the chaff) Aegobolus (the goat killer) Acratophorus (the god who won’t mix his wine with water) Dimetor (born of two mothers) Evius, Iacchus – his names and eponyms are many. The stage of the ancient Greek world was almost completely dedicated to him. All the plays we have in existence -tragedies, comedies and satyr plays- are plays written so as to be presented at the two festivals celebrated in his honour, one in Spring and one in Winter, with fierce competition for the first prize. Though we can lament the disappearance of well over 300 plays written by these four dramaturges as well as a great many by others, we can, nevertheless be thankful for those that have survived for us because they still manage to give us a fairly good understanding of the immense talent as well as the character of that population, of the nature of the humours that flowed and mingled through their bodies; of the ways and the turns of their lives and minds and of the shape and weight of their concerns. There is a surfeit of excellent translations of all these dramaturges already available both, here on the net and in the bookshops of the world and I know that my own efforts will only add to that surfeit as well as to the befuddlement of those who search for the definitive translation. Alas, the “befuddled” will remain so, no matter how many more translations are placed in the web and upon the book shelves because such a thing as a definitive translation can never exist. As language changes, as it evolves with the ever-tilling of its cultural ground; as the customs, the ethics, the morals and the philosophies of people are questioned, reformed, deformed, reconstructed and deconstructed, as History rolls one war upon another, one religious movement upon another, one Philosophy upon another, her pages ever-burgeoning and ever-falling like the leaves in a forest, so must any work that asks us to think, should be considered with ever-refreshed senses. New words, new notions, new imagination must be applied and translators should keep their eyes, ears and minds well awake to these changes and evolutions and must constantly revisit the original works. Translating, without wishing to labour the metaphor or the act, is the art of cooking the same dish using, very often, vastly different ingredients. One can only try to convey with these new ingredients, as many of the effects the original had once conveyed: the flavour, the aroma, the look on the plate and that on the faces of those before it; and that, of course is the main thing, the faces on those before the dish: are they the same as those that were before the original dish? Are they as pleased to see it, to smell it, to eat it? That is the aim of a translator, an aim which he or she must pursue with the deepest, most heartfelt passion. I hope I’ve been reasonably successful in doing that… Imagine cooking a lamb souvlaki using only vegetables and presenting it to the carnivorous epicureans in the hope that they don’t notice the difference! Of course they will, but the real test would be if they will still like it. I invite my visitors to check these translations and to send me their comments, in all honesty and in the certainty that I shall pay them my fullest attention. More than anything else, I hope that the reader of these works will enjoy them as much as the audience of the 5th century BC, who saw them performed for the first time. Tony’s site is effusive with translations of some of the best works in Literature and effulgent with the thoughts of some of the best minds ever recorded. My profound gratitude to Warrigal Mirriyuula for the design of the header. May Zeus bless his generous, effusive, profuse, prolific and profanely artistic soul. …And to my dear, playful daughter who unequivocally has the requisite genius to make me look far younger and far more good humoured than I am! Under no circumstances should any of this work be used as part of a collage, which includes the work of other writers or translators, without the written permission of the copyright owner. 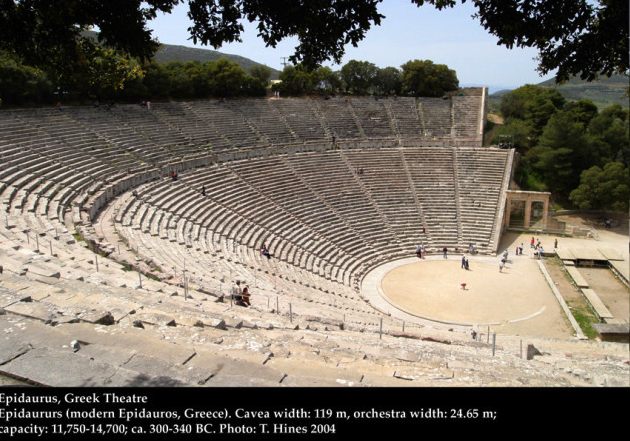 The Epidaurus Theatre, where an audience of up to 15,000 can hear the whisper of a single actor. 4thC, BC. Give me a place to stand and, ouzo permitting, I shall! Image | This entry was posted in Uncategorized and tagged Achilles, Admetus, Aeneas, Aeschylus, Aeschylus' Persians, Agamamenon, Agathon, Agave, Aigeas, Aigisthus, Aischylos, Aischylus, Alcestis, Alexandros, Anacreon, Ancient Greek plays, Ancient Greek Translations, Andromache, Antigone, Aphrodite, Apollo, Ares, Argos, Aristophanes, Aristophanes' Acharnians, Aristophanes' Birds, Aristophanes' Clouds, Aristophanes' Frogs, Aristophanes' Knights, Aristophanes' Lysistrata, Aristophanes' Peace, Aristophanes' Ploutos, Aristophanes' Wasps, Aristophanes' Wealth, Artemis, Asclepiades, Astyanax, Athena, Atossa, Bacchylides, Cadmus, Caloniki, Cassandra, Castor, Charon, Choephoroi, Chrysothemis, Cinesias, Clytaemestra, Colonus, Creon, Danaus, Darius, Deianeira, Demos, Demosthenes, Diomedes, Dolon, Ecclesiazousae, Electra, Elektra, English Translation, Eteocles, Eumenides, Euripides, Euripides' Bacchae, Euripides' Cyclops, Euripides' Medea, Eurydice, George Theodoridis, Hades, Hector, Hecuba, Hedylus, Hekabe, Hektor, Hephaistos, Heracleidae, Heracles, Herakleidae, Herakles, Hercules, Hermes, Hermione, Hestia, Hippolytus, Hyllus, Ibycus, Io, Ion, Ion of Chios, Iphigeneia in Aulis, Iphigeneia in Tauris, Ismene, Ismenia, Jason, Jocasta, Jokasta, Kassandra, Kastor, Kinesias, Kleisthenes, Kratos, Lamachus, Lampito, Lost ancient Greek plays, Lyssa, marble seasons, Megara, Melanippides, Menelaos, Menelaus, Myrrhini, Neoptolemos, Nikias, Oceanus, Odysseus, Oedipus at Colonus, Oedipus Rex, Orestes, Paphlagon, Paris, Pelasgus, Peleas, Pentheus, Phaedra, Philoktetes, Pluto, Polydeuces, Polynices, Polyxene, Poseidippus, Poseidon, Praxilla, Prometheus Bound, Pseudoartabas, Pylades, Pythian, Rhesus, Sappho, Seven Against Thebes, Silenus, Socrates, Sophocles, Sophocles' Ajax, Stesichorus, Suppliant Maidens, Suppliant Women, Tecmessa, Teiresias, Teucer, Thanatos, Thebes, Theseus, Thesmophoriazousae, Thetis, Timotheus, Trachis, Trojan Women, Troy, Trygeas, Tyndareus, Via, Women at the Festival, Women in Parliament, Xanthias, Xerxes. Bookmark the permalink. I had to have a look and, to be frank, I feel simply translated by your site Prof. Theodoridis. What was once “all Greek to me”, is now, thanks to your transcendent transliterations, your logical linguistic locutions, perfectly parsed and proudly presented periphrastic Peleponnesian plays! 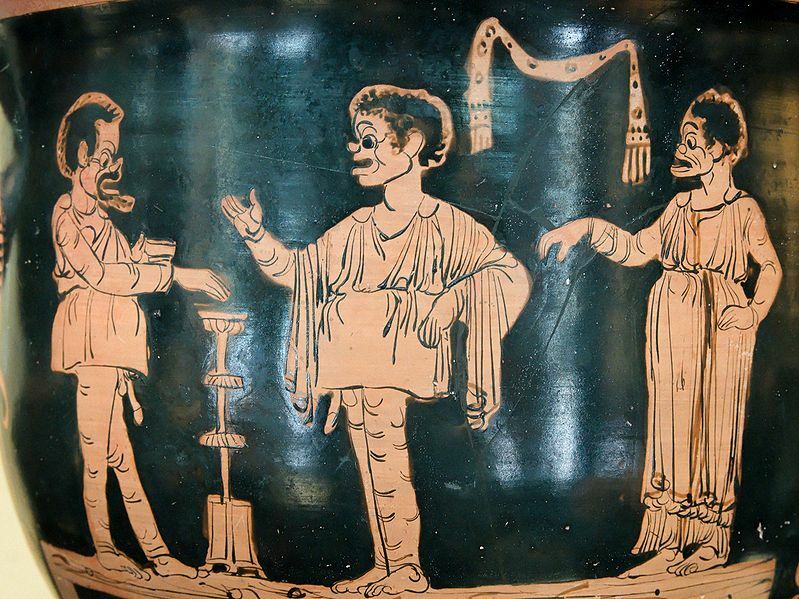 Though, I must thank you, sir, not to insult these Athenians by calling their profusely eloquent and elegantly dramatic output “Peloponnesian!” No, sir, these are the delightful extrications of genuinely Attic, ie Athenian-born-and-bred writers, the paragons of thought and of theatre. Their protagonists, deuteragonists and minor characters are the very archetypes of Literature, the emblems of human behaviour throughout the ages that followed them and shall follow us for ever more! Incidentally, your playful alliterations are amorously accepted. Lovingly, even! Yeah, but “Attic” doesn’t start with a “P”. No, I use that on the loo. You must have a very classic loo, Warrigal. Fifth Century BC, is it? Golden Age? It was meant for the foyer loo in the Parthenon but they were over supplied and I picked it up at a clearance sale for a few drachmas. The instructions included a paragraph about how if you didn’t use Periclean then your warranty would be void. Yeah, that’d be right! That’s the ancient Greeks fer ya! Down at Delphi, you gotta buy loo paper from them that has the words “know thyself” printed all over them and the photo of some bearded old dude. I mean to say! “know thyself” by your loo paper? Resonatingly profound Mou, positively Delphic if you get my drift. For how much more intimate can we be with ourselves than when we wipe our bottoms. It’s symphonic with semiotic possibilities. I must get some me some of that Delphic bottom fodder. To complete the Attic look so to speak. Just to add: I posted that, above, tongue in cheek (after your godly summons)–and prior to reading your mission statement . May I just say it (the statement) is full of noble and laudable intent. So best of luck from me and my (various)ψευδώνυμον, George. Laddie, I thank thee for appearing at my holy precincts! The baptism is looking good! This traveler does indeed feel welcomed. So happy you’ve made the move to these delightful clear streams. Bravery award for eating natto! It is yiorgala! Great fun! Hard work but great fun. Keep in touch, young coz! I just came back today to say g’day, and how are you really. The other place is a little dysfunctional at the moment. So I thought, I wonder how things are in ancient Greece. You might have heard though, that the attack by the barbarians, by way of financial rip offs, has caused much turmoil in the land and gods, like Zeus and Athena, are prayed to and invoked on a daily basis, hoping they’ll intervene and stop these attacks. We are almost at the precipice of internecine wars -certainly a raising tide of popular discontent- and its leaders, Papandreou and Samaras, are behaving in the very same manner as do the leaders of this ancient land, Australia, where Mz Gillard and Mr Abbott are in agreement about everything except who should be the PM. Unfortunate circumstances prevail there, as they do here. The same is going on also in the other ancient land, America, of course, where, again the sitting Govn’t and the Opposition are bereft of any morals, ethics or tactics and differ only on who should be the President. Politics (aka the Economy) in all three ancient lands have taken strident precedence over the needs of the people and “politicians” who no longer serve the definition and duties inherent in word “politics” as Aristotle had observed, almost two-and-a-half thousand years ago, are furiously manipulated by the insatiable capitalist corporations, whose cancerous tentacles have diseased almost every corner of our planet. The Greece of the greatest philosophers ever lived, the Greece where the exhortation “know thyself” and “excellence in moderation” were born, is in the grips of those who hate both of these exhortations and are galloping full pelt towards destruction. Destruction no matter what! May Apollo shine the light on the errors of their ways and may his sister, Diana, the divine huntress, hunt and kill these gluttonous beasts! Bibliotheca Alexandrina Egypt Perpustakaan Iskandariah Mesir merupakan perpustakaan pertama dan terbesar di dunia.